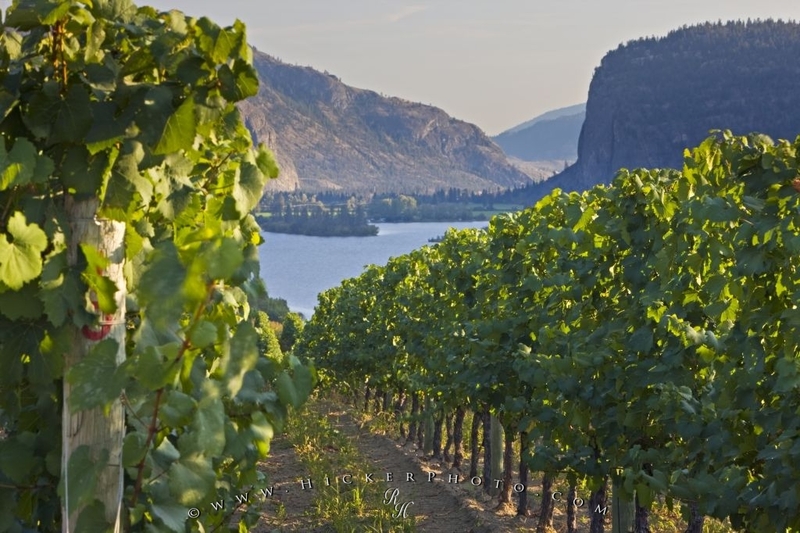 A fine day in the scenic Okanagan Valley at Blue Mountain Vineyard and Cellars where rows of grapevines grow on the hillsides offering views of Vaseux Lake and the surrounding landscape. Grapevines of Blue Mountain Vineyard and Cellars, Okanagan Falls with views of Vaseux Lake, Okanagan Similkameen Region, Okanagan, British Columbia, Canada. Scenic photo of the view from the Blue Mountain Vineyard and Cellars of grapevines and Vaseux Lake.